We love how moist and fragrant this Banana Vanilla Chai Amish Friendship Bread Coffee Cake is! 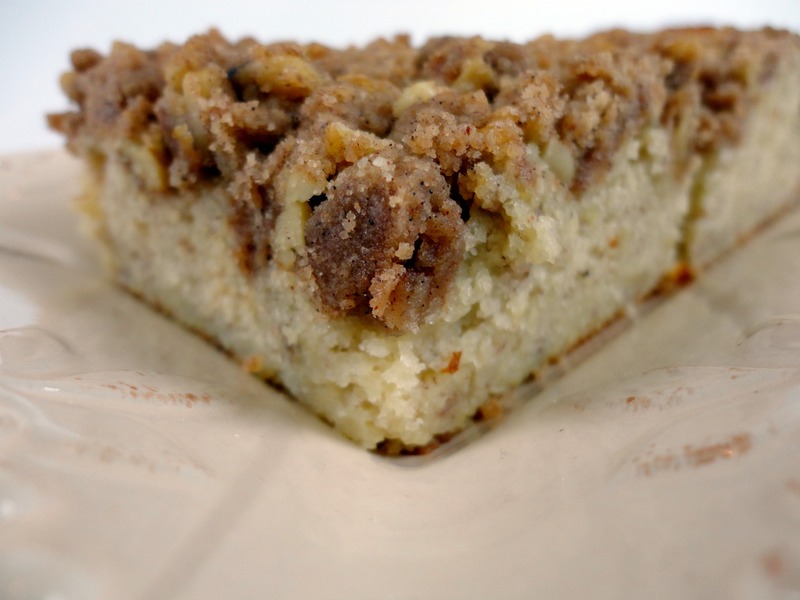 Submitted by Kitchen Friend Veronica Miller, it’s topped with a chai streusel that gives the coffee cake a spicy crunch. This is a great way to use up any extra starter — take it into the office or book club meeting and get ready for the compliments to start rolling in. Bring this moist and spicy Banana Vanilla Chai Amish Friendship Bread Coffee Cake to the office and you'll be getting compliments all day. Generously butter a 9” x 13” cake pan and set aside. Make the chai streusel: combine the sugars, vanilla bean seeds, cinnamon, cardamom, ginger, cloves, nutmeg and salt in a small mixing bowl; stirring with a fork until well combined. Stir in the walnuts, then pour the butter over the top and mix until combined. Add the flour and mix until incorporated. Set aside. Make the coffee cake batter: mash the bananas in a large mixing bowl. Whisk in the melted butter until completely incorporated, then add eggs, sour cream, starter and vanilla until combined. Add the remaining ingredients and beat until well mixed. 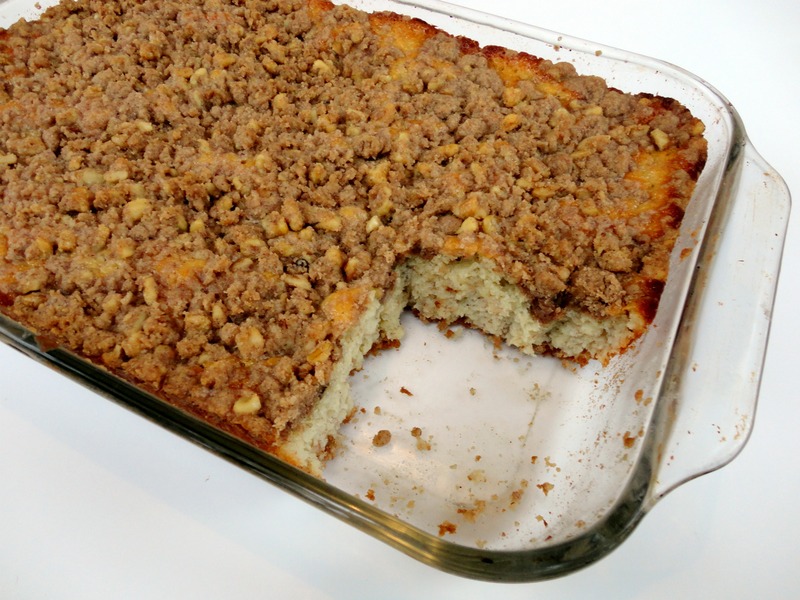 Pour batter into the prepared cake pan and sprinkle the streusel over the top. Bake for 40 minutes or until toothpick inserted into the center comes out clean. Serve warm or at room temperature. Cover leftovers with plastic wrap. looks very yummy. thank you. I made this a couple of nights ago. Very yummy, thanks for sharing! I enjoyed a little bit for now and froze a lot for later, I have a feeling it will freeze well. Hi Emily! You’re welcome! Yes, most Amish Friendship Bread recipes (including this one) freeze really well. They thaw quickly and then you can eat at room temperature or give it a quick toast. Thanks for joining us in the Kitchen–it’s great to have you here! I have a dear friend who loves chai. Can’t wait to make this for her. My husband would enjoy this very much! I believe my mom and sister-in-law would love the AMISH FRIENDSHIP BREAD BANANA VANILLA CHAI COFFEE CAKE. My mom absolutely loves banana bread and coffee so this might be the perfect dessert to try as a special treat. I’d make this for Ann Davis and Debbie Gorham. I am excited to try this. I love banana and chai. It’s on the top of my list for my next small group gathering.